SAP Business ByDesign is an end-to-end cloud ERP solution designed to integrate your departmental silos into one united business. With flexible business processes designed on best practices, it’s designed to connect your organisation and provide access to accurate, real-time data. With the ability to scale and compete without increasing the complexity, you have the opportunity to grow your business your way. SAP Business ByDesign is a holistic, user-friendly application deployed to more than 4000 organisations over 120 countries. Unify your core business functions in one end-to-end solution encompassing finance, HR, CRM, supply chain, project management and suppliers. With pre-built processes provided within a cloud-based platform you can standardise your workflows and manage your company as one organisation. Not only do you get a quick to implement solution, you gain the ability to equip users with access to a central system on their mobile devices, enabling them to complete their day to day tasks anytime, anywhere. With the ability to scale the solution from 20 to 10, 000 users, you can easily re-configure business processes to scale as your business grows. The solution has a variety of toolkits built on local best practices, so you can rest assured it will adapt to different tax regulations, languages and currencies, enabling you to grow and enter new markets. With pre-built integrations and APIs to plug in to other solutions, SAP Business ByDesign provides the flexibility and extensibility required to help you grow. Bring transparency to your organisation with one unified approach to data analysis. 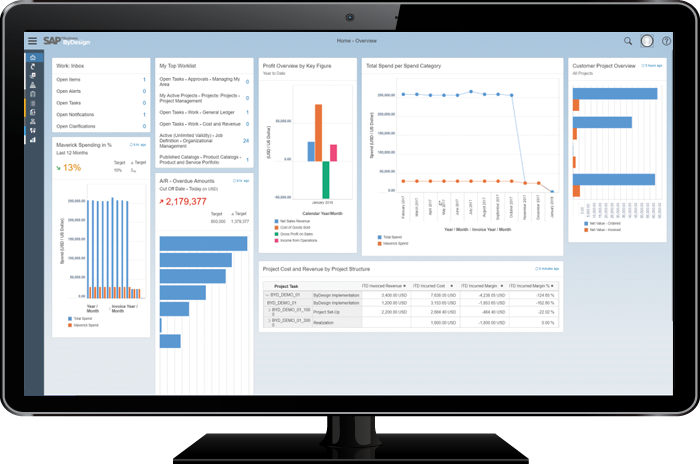 With more than 500 reports and pre-built KPIs, you can equip your team with the most accurate, real-time data to make informed decisions. Access all the key information you need on your mobile device – meaning you don’t have to rely on someone else to deliver your reports. One clear view of the business shows you the issues and opportunities you can take advantage of now, allowing you to respond quickly to changes in the market. This module allows you to streamline your accounting processes and manage your cashflow. Manage multiple operating units, currencies or reporting standards across your organisation, and use your transactional data to gain real-time visibility into your current cash and liquidity positions. Using an all-in-one solution you can drive customer engagement and manage your sales, marketing and service functions in one solution which expertly combines your front and back-office processes. Equip your Marketing team with relevant insights to create more effective lead-generation campaigns and qualifications. Enable your Sales force to fully automate their sales process, from first customer interaction through to invoicing, improving your overall account management. Deliver superior support results using a unified platform which gives you visibility into how your customers respond to you – ultimately improving your customer satisfaction scores. Organise your HR requirements in one single solution which includes organisation management, time and attendance and workforce administration. With easy user setup you can ensure you onboard employees quickly, providing them role-based access to manage their timesheets and expenses in a self-service manner. Empower users to update their personal information and push out company-wide policies from one central location to gather compliance. With integrations available for payroll too, you can facilitate payroll processing and compensation in one system. Manage all purchase requests and automate processes including approvals. Improve your supply chain effectiveness with faster responses to shifts in supply and demand. Accelerate your product development cycle and time to market by making sure your design meets the specifications laid out by your customers, while still producing high-quality goods. Get a clear picture of your supply chain – both internal and external – with up to date inventory and cost transparency, particularly if you operate in asset-intensive industries. Manage production and automate processes to fast-track your time to market, and control inventory flows with an exception driven approach to procurement. SAP Business ByDesign is also offered on a private cloud environment. This is dedicated entirely to your organisation and gives you more flexibility to upgrade your deployment when it suits your business. This option is more suited to larger companies who need greater control over their business software.